Join Martha as she shares three iconic recipes highlighting Latin America’s rich culinary heritage. 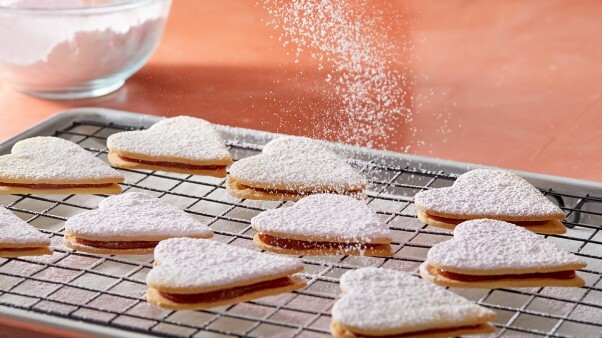 Cinnamon-sugar coated polvorones get their name from the word polvo, meaning “dust” in Spanish, bite-sized sandwich cookies known as casadinhos, which is the Portuguese word for married, and Guatemalan champurradas made with locally grown sesame seeds. Recipes so delicious, you’ll want to travel to Latin America! Make Martha Stewart's Guatemalan Sesame Cookies (Champurradas) from the Latin American Cookies episode of Martha Bakes. In the bowl of an electric mixer fitted with the paddle attachment, beat together butter, piloncillo sugar, and 3/4 cup granulated sugar on medium speed until light and fluffy, about 2 minutes. Add whole eggs, one at a time, mixing well after each addition, and scraping down sides of bowl as needed. Beat in vanilla. Reduce speed to low; mix in flour mixture until fully incorporated. Cover bowl with plastic and refrigerate until firm, at least 30 minutes. Preheat oven to 350 degrees. Using a 1 1/2-inch ice cream scoop, drop dough onto a parchment-lined baking sheet. Freeze 20 minutes. Roll dough into balls (if dough becomes too soft, refrigerate until firm). Place egg whites, sesame seeds, and remaining 1/4 cup sugar in three separate shallow bowls. Working with one ball at a time, roll first in sugar, then egg whites, and finally sesame seeds until thoroughly coated. Divide evenly among four parchment-lined baking sheets. Bake until golden around the edges but still tender on top, 12 to 14 minutes. Transfer sheets to wire racks and let cool completely. Cookies can be stored in an airtight container at room temperature up to 2 days.